work of faculty libraries and control over supplying textbooks and methodological literature to the libraries. 1980 – He graduated from the Ivan Franko State University of Lviv, Faculty of Chemistry. 1980-1981 – Engineer at the R&D Institute of Materials (Lviv), 1982-1988 – postgraduate student, Engineer, Senior Research Fellow at Lviv Polytechnic Institute. 1987 – He presented his Candidate dissertation at the Lomonosov State University of Moscow. 1988-1990 – Senior Research Fellow at Department of Semiconductor Physics at Lviv University. 1990-1997 – Research Fellow at the University of Geneva (Switzerland), Professor at the University of Savoy (France). 1997 – He started doctoral studies at the Department of Inorganic Chemistry at Lviv University. 2001 – He presented his Doctoral thesis in Lviv. 2000-2005 – He was granted the academic titles of Docent and Professor. 2006 – Chairperson of Department of Inorganic Chemistry at Lviv University and Head of Scientific School «Crystal Chemistry». 2012 – Elected Corresponding Member of the National Academy of Sciences of Ukraine in Crystal Chemistry. 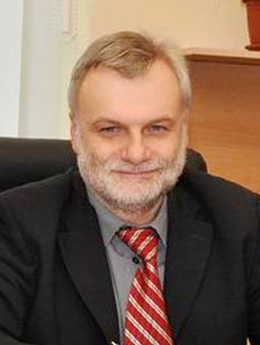 Member of the Bureau of Scientific Council for Inorganic Chemistry of National Academy of Sciences of Ukraine (since 2003), Head of Committee of Crystallographers of Ukraine (since 2004), member of Expert Council for the Examination of Dissertations in Chemical Sciences of the Ministry of Education and Science of Ukraine (since 2006), member of Academic Council of Lviv University, member of the Specialized Academic Council for Chemical Sciences at Lviv University; Editor-in-Chief of International Journal «Chemistry of Metals and Alloys – Хімія металів і сплавів» (since 2008); Head of the Organizing Committee of the International Conference in Crystal Chemistry of Intermetallic Compounds (since 2002), School for Young Researchers «Diffraction Methods for Determining the Structure of Substance», Regional Competition for Pupils «Crystals»; IUCr member, NTSh (Shevchenko Scientific Society) member. In 1981, Roman Gladyshevskii was awarded Medal of the USSR Academy of Sciences for the best student paper. In 2008, he became the laureate of the State Prize of Ukraine in Science and Technology; he also received ICDD awards (USA, 2008-2012). Investigation of constitution diagrams of systems, crystal structure and physical properties in order to establish the correlation between composition, structure and properties of inorganic compounds, including intermetallic compounds and high-temperature superconductors. Co-author of 16 monographs (e.g. Landolt-Börnstein series), 3 review articles, 7 patents and 532 academic articles and abstracts. He supervised 8 dissertations which were defended at Lviv University, and co-supervised five dissertations which were defended abroad. He teaches the following courses at Lviv University: Inorganic Chemistry, Crystal Chemistry, Methods to Determine Crystal Structure of Substance, Applied Crystal Chemistry, Physical Properties of Inorganic Materials; he also taught a course in crystallography at the University of Savoy. He prepared 19 teaching materials such as textbooks in crystal chemistry in English and French. In 2010, Roman Gladyshevskii was elected Academician of the Higher Education Academy of Sciences of Ukraine.